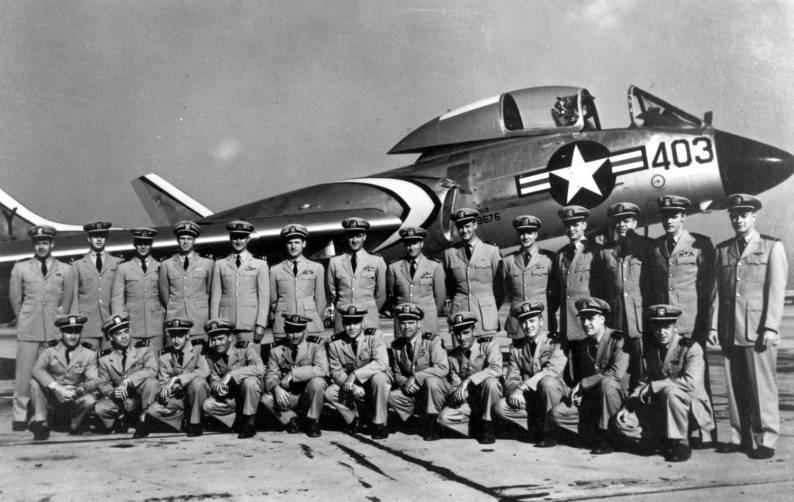 Strike Fighter Squadron 83, originally Naval Reserve Fighter Squadron 916, was called into active duty at NAS Squantum, Massachusetts, in April 1950. Shortly thereafter, VF-916 moved to NAS Oceana as part of Air Group Eight. 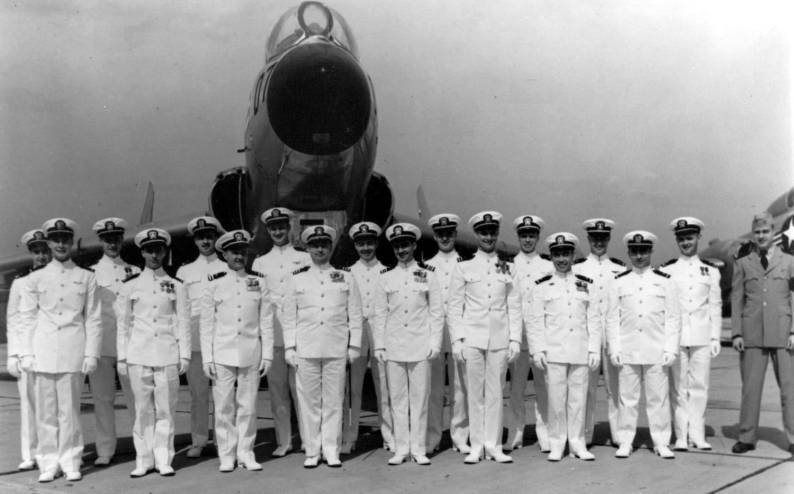 As a fighter squadron, VF-916 flew the F-4U “Corsair," the F-8F “Bearcat,” the F9F-5 “Panther,” and the F-7U “Cutlass” from the decks of USS SAIPAN, USS MIDWAY, and USS CORAL SEA. 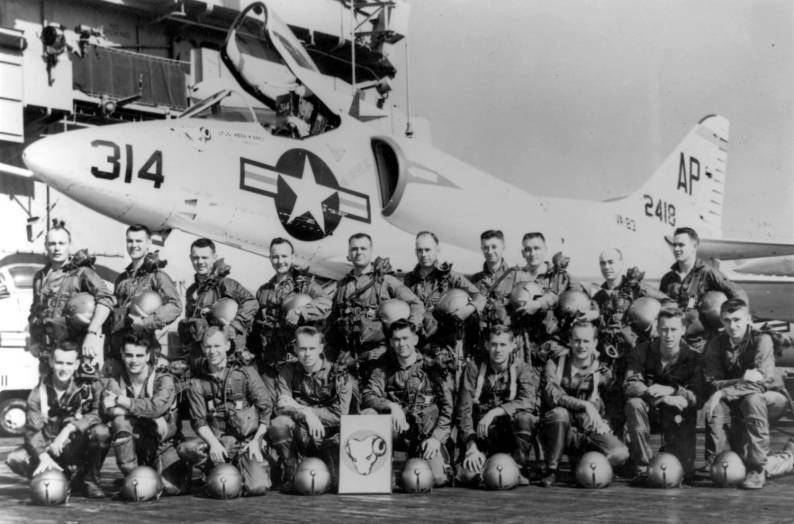 In 1955, the squadron was re-designated Light Attack Squadron 83 and in 1957 received its first A-4 “Skyhawks." During the “Skyhawk” years, the RAMPAGERS operated from the decks of USS ESSEX, USS FORRESTAL, USS SARATOGA, USS SHANGRI-LA, and USS JOHN F. KENNEDY. In 1961 and 1962, VA-83 won the Battle Efficiency “E” Pennant. In 1966, the squadron moved to NAS Cecil Field. 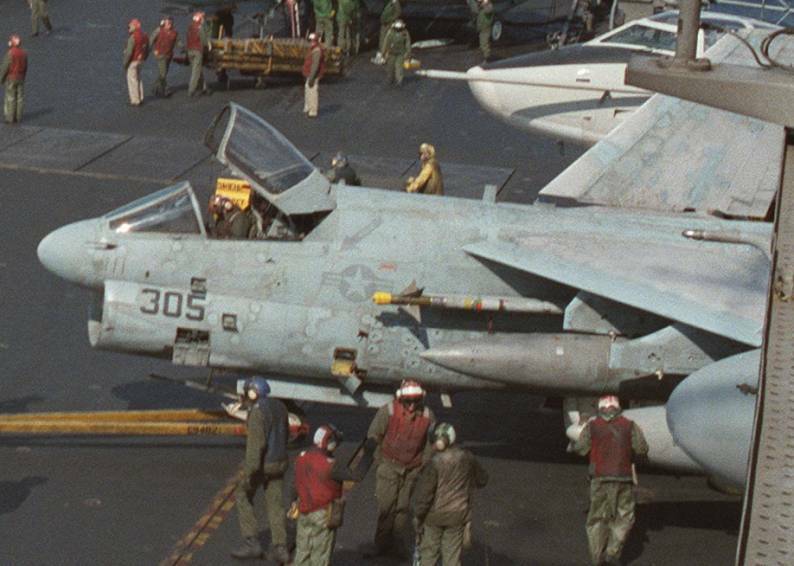 As part of Air Wing ONE, VA-83 was the last squadron to fly A-4’s aboard USS JOHN F. KENNEDY. Later that same year, the “Skyhawks” were traded in for the new A-7 “Corsairs." 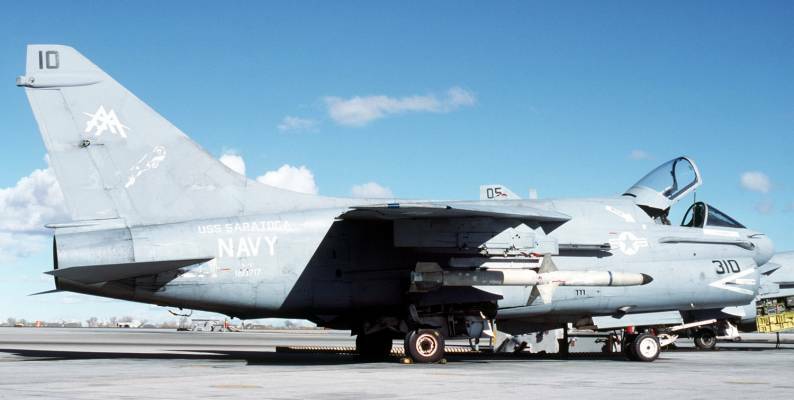 In January 1971, VA-83 deployed with Air Wing SEVENTEEN on USS FORRESTAL, compiling a perfect safety record and distinguishing itself by being one of the first squadrons to fly the A-7E on deployment. In 1973, the squadron won its third CNO Aviation Safety Award and in March 1974 commenced its fourteenth Mediterranean deployment. 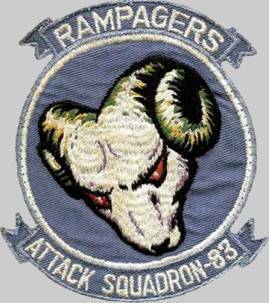 During this deployment, the RAMPAGERS helped provide U.S. Naval presence in response to the Cyprus crisis and completed more than ten months at sea. 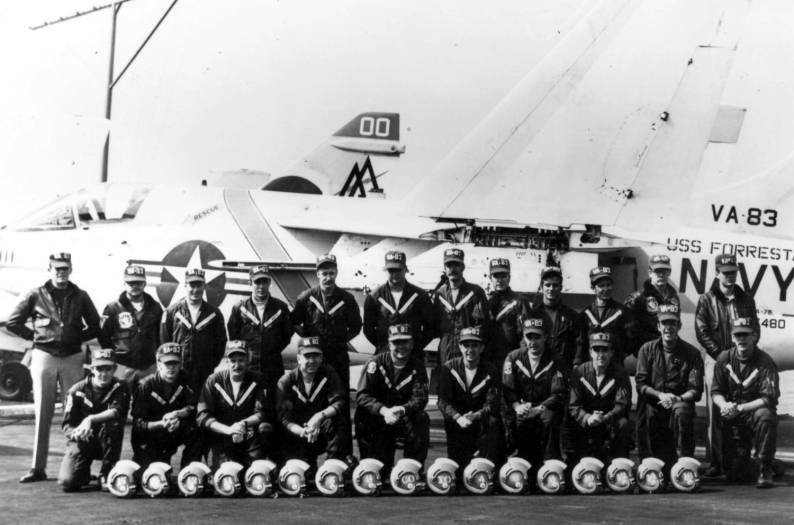 During deployment in 1975, VA-83 completed its twenty-fifth year as an active squadron, surpassed 20,000 accident free flight hours and earned another CNO Safety Award. Between 1975 and 1982, the squadron made three deployments, including extensive operations with NATO allies in the North Atlantic. 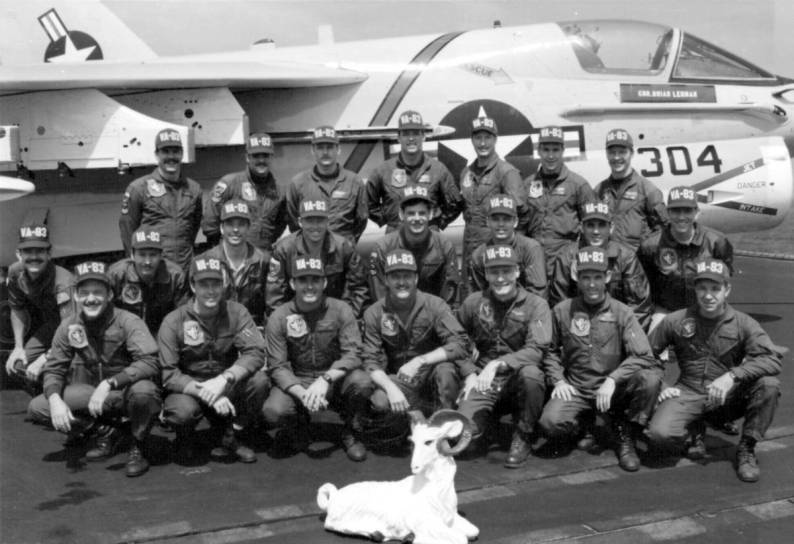 Aboard USS FORRESTAL for the last time beginning in March 1982, the squadron supported American peacekeeping forces in Lebanon, during and after OPERATION PEACE FOR GALILEE. In 1983, VA-83 began operations aboard USS SARATOGA. The 1985-86 deployment was highlighted by Rampager participation in the successful execution of OPERATION ACHILLE LAURO. The squadron left Cecil Field on 05 June 1987 for its twenty-second Mediterranean, and final “Corsair,” deployment. 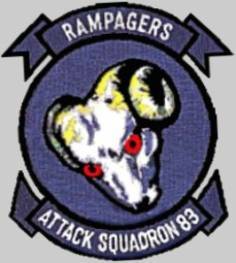 Upon return to Cecil Field in November, the RAMPAGERS received twelve new F/A-18C “Hornets” and on March 1, 1988 the squadron was re-designated Strike Fighter Squadron 83. VFA-83 was originally formed as Naval Reserve Fighter Squadron 916 at NAS Squantum in Massachusetts in April 1950. VF-916 was called to active duty in NAS Jacksonville on 11 February 1951 and moved to NAS Oceana, Virginia in September 1951. The squadron was assigned to Carrier Air Group 8 (CVG-8) and was equipped with the Vought F4U-4 Corsair. 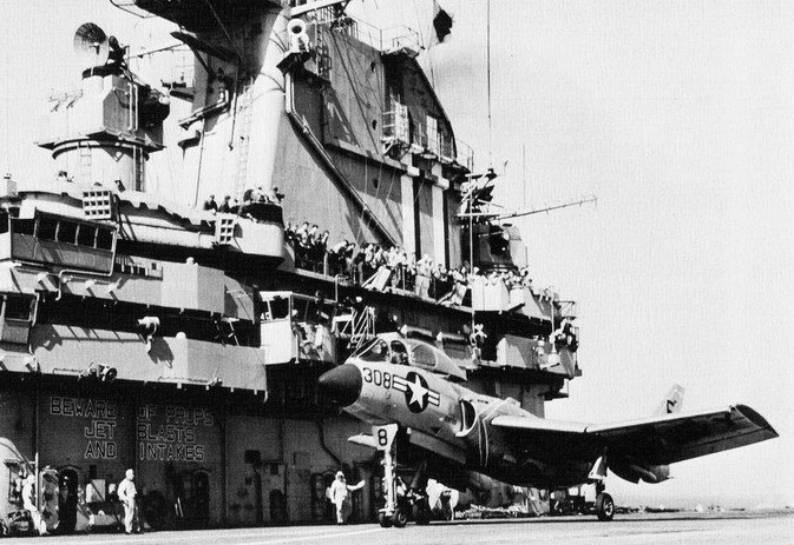 CVG-8 was deployed aboard the aircraft carrier USS Tarawa to the Mediterranean Sea from November 1951 to June 1952. Afterwards VF-916 transitioned to the Grumman F9F-5 Panther. They also flew the F8F Bearcat for a short time in 1952. On 4 February 1953, the squadron was redesignated fighter squadron VF-83. In the same year VF-83 made a deployment aboard the USS Coral Sea to the Mediterranean Sea. In August 1954, VF-83 transitioned to the Vought F7U-3M Cutlass equipped with the Sparrow I air-to-air missile, and on 1 July 1955 was re-designated as attack squadron VA-83. VA-83 made another deployment to the Mediterreanean Sea aboard the USS Intrepid in 1956, this being the first overseas deployment of a naval missile squadron. 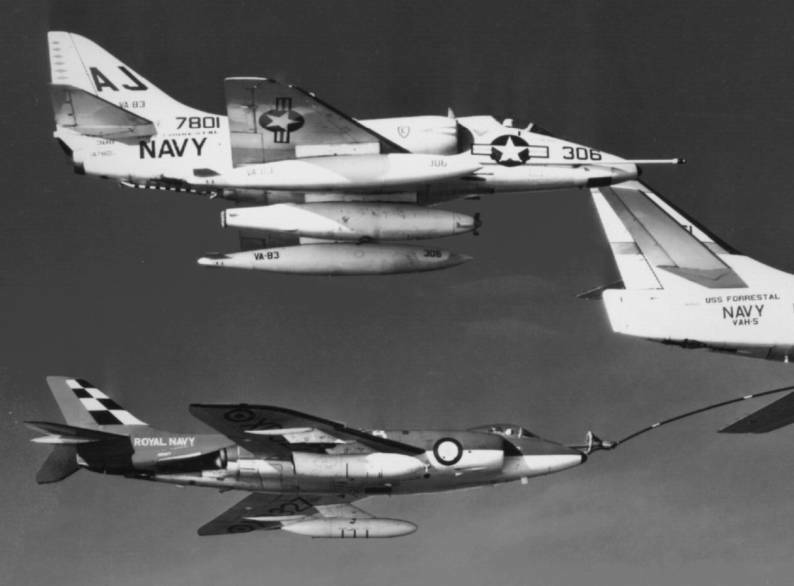 The squadron received the Douglas A4D-1 Skyhawk in March 1957 and then in December 1957, was the first fleet squadron to receive the A4D-2 version, which was the first to be equipped with an aerial refueling capability. From July to August 1958 following continued civil violence in Lebanon, VA-83 was deployed as part of Air Task Group 201 (ATG-201) aboard the USS Essex. The squadron flew sorties during the U.S. Marine Corps landings in Lebanon, and two of its aircraft were hit by hostile small arms fire receiving minor damage. In September 1958 the squadron conducted flight operations from the Essex while operating in the Taiwan Straits in response to the People’s Republic of China shelling of the Quemoy Islands. 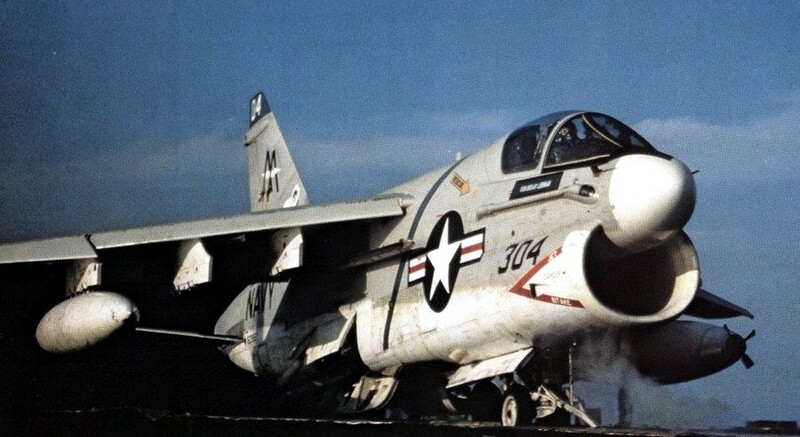 From 1960 to 1966 VA-83 made five deployments with Carrier Air Wing 8 (CVW-8) aboard the USS Forrestal to the Mediterranean Sea, the first still flying the A-4B, then two with the A-4C, and two with the A-4E. In 1961 and 1962 they won the COMNAVAIRLANT Battle “E”. In Aug 1962, a squadron A4D-2N Skyhawk crossdecked aboard the British carrier HMS Hermes. 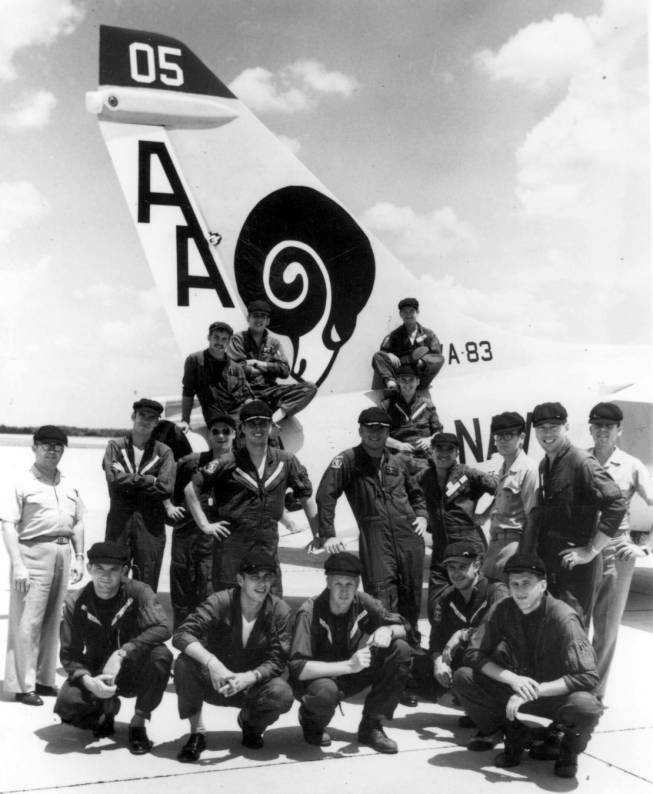 In late 1963 a detachment of VA-83 also operated from the USS Lake Champlain providing fighter cover for Anti-Submarine Carrier Air Group 52 (CVSG-52). On 15 Jun 1966 they re-located to NAS Cecil Field in Florida. In 1966-67 and 1967-68 CVW-8 and VA-83 were deployed on the USS Shangri-La, and in 1969 on the USS John F. Kennedy. 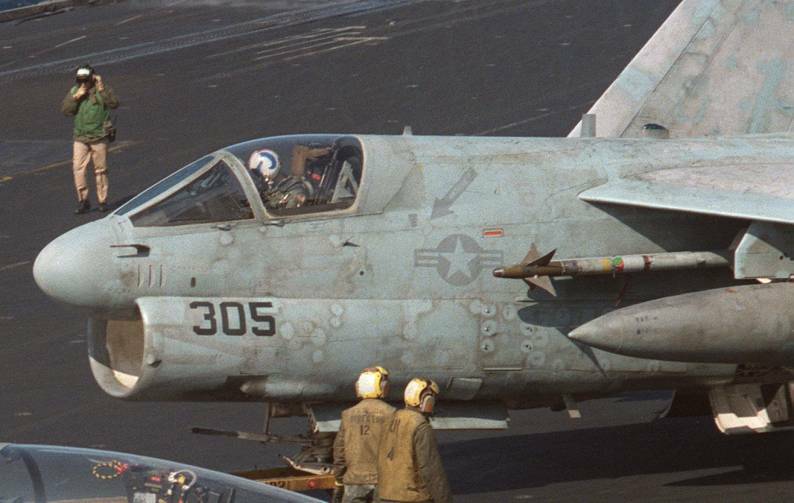 During the last two deployments the squadron flew again A-4Cs. In June 1970, VA-83 transitioned to the A-7 Corsair II and was reassigned to Carrier Air Wing Seventeen (CVW-17). From January 1971 to November 1982 VA-83 deployed eight times aboard the Forrestal to the Mediterranean Sea. In 1973, the squadron won its third CNO Aviation Safety Award and in March 1974 they began their 14th Mediterranean Sea deployment. From July to August 1974, the squadron operated in the vicinity of Cyprus following a coup in that country and its invasion by Turkish forces. In 1975 they completed their 25th year as an active squadron, and had amassed 20,000 accident free flight hours which earned them another CNO Safety Award. Between 1975 and 1982 they made three deployments, including training operations with NATO allies in the North Atlantic. From May to June 1981 while embarked in Forrestal, VA-83 operated in the eastern Mediterranean following Israeli reprisal raids against Syrian missile batteries located in southern Lebanon. In Aug 1981, the squadron participated in a Freedom of Navigation Exercise in the Gulf of Sidra. During this exercise two F-14 Tomcats from Nimitz shot down two Libyan SU-22 Fitters on 18 August. 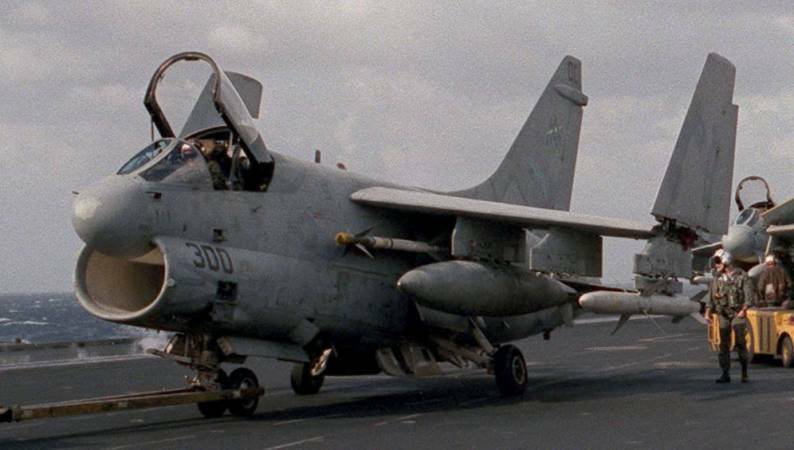 Tensions escalated and VA-83 flew reconnaissance missions over potentially hostile Libyan ships. In 1982 they deployed to support peacekeeping forces in Lebanon. Between 1984 and 1994 VA-83 and CVW-17 were assigned for six deployments to the USS Saratoga. During the 1985-1986 cruise they supported operations in the Indian Ocean as well as operations in the Mediterranean Sea and Operation El Dorado Canyon against Libya. Squadron aircraft fired AGM-88 HARMs against a Libyan missile radar site, marking the first use of that missile in combat. 1987 marked their final deployment with the Corsair, and in November they began the transition to the McDonnell Douglas F/A-18C Hornet, and on 1 March 1988 were re-designated to Strike Fighter Squadron VFA-83.